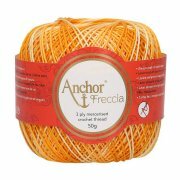 Freccia is the European core brand of Anchor, its essence, its heart and its foundation. 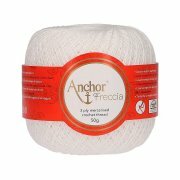 The uniqueness of Freccia lies in the blend of its twist, yarn structure (3 ply), and high quality mercerised cotton: a delicate balance of softness, flexibility, body and brightness. 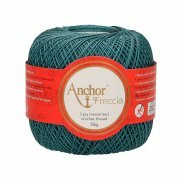 Freccia is by essence a versatile yarn which developed quickly across Europe and gained a great following among different cultures, tastes and skill requirements. 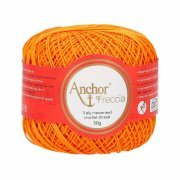 With a 6 thread thicknesses and with almost 100 shades, Freccia won the hearts of crafters looking for an easy yarn with fantastic performance. Each year Freccia is supported by strong design campaigns backed up by recognised designers that mirror the latest fashion trends in style, looks and colours. 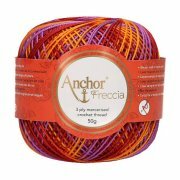 Freccia speaks to both beginners and skilled crafters, to those who look for inspiration as well as to those already inspired who look for the perfect yarn for their projects. 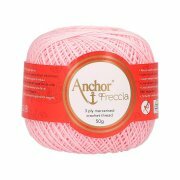 Freccia is ideal for home decoration projects, fashion wear as well as for baby garments. Be inspired and be creative with Freccia. Anchor Freccia is Oekotex 100 Standard certified. 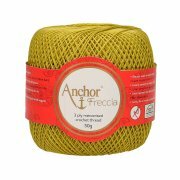 We offer Anchor Freccia in the entire available colour range only in complete sales units, not individually. You save 10% compared to the normal retail price. 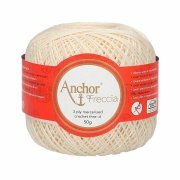 We do not have Freccia in stock ourselves and order it after your order from the manufacturer for you. 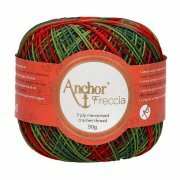 We will then have the yarn ready to ship in 4 to 5 working days.